All you need for lunch is protein and vegetables - that is what most people will say when it comes to eating healthy. 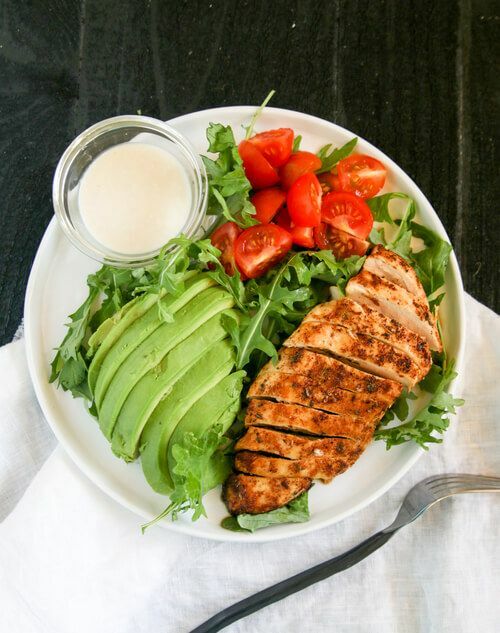 This Cajun chicken with greens avocado and tomato will not just give you a healthy and satisfying lunch, but it will also spice it up with the flavors from homemade Cajun seasoning. I like to use simple organic seasoning brand when spicing things up. Also you can add more of each spice if you want things more heated. Did you know that the smaller the avocado, the more fat it has? It's all good fat, but it's also calories. You should only eat 1/2 of an avocado at each meal not the whole. The chopped mustard greens that go into this salad are full of amazing benefits. They contain cancer fighting agents and work as an antioxidant and and anti-flammatory. Prepare cajun chicken: Mix 1/2 teaspoon salt, 1/2 teaspoon paprika, 1/2 teaspoon garlic powder, 1/8 teaspoon black pepper, 1/8 teaspoon onion powder, a pinch of cayenne, 1/4 teaspoon dry thyme, 1/4 teaspoon dry oregano. Sprinkle over 1 boneless skinless chicken breast. Sauté the chicken breast with 1 Tablespoon extra virgin olive oil for 5-7 minutes each side; or until cooked through. Salad: On a serving plate arrange greens, tomato, avocado, and red onion. Slice chicken breast, and add to the salad. Dressing: In a small bowl whisk together 1 Tablespoon mayonnaise, 3 pinches of sugar, and 1 teaspoon apple cider vinegar. Drizzle on salad. Mix 1/2 teaspoon salt, 1/2 teaspoon paprika, 1/2 teaspoon garlic powder, 1/8 teaspoon black pepper, 1/8 teaspoon onion powder, pinch of cayenne , 1/4 teaspoon dry thyme, 1/4 teaspoon dry oregano. Sprinkle over 1 boneless skinless chicken breast. Sauté the chicken breast with 1 Tablespoon extra virgin olive oil for 5-7 minutes each side; or until cooked through. On a serving plate arrange greens, tomato, avocado, and red onion. Slice chicken breast, add to the greens.